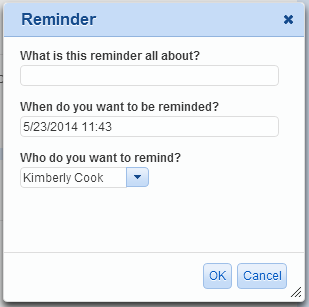 *Enterprise Edition uses the extended Tasks feature rather than Reminders. The Tasks feature allows TeamSupport users to assign and track multiple tasks for other users or themselves on a single ticket. Click here to learn about Tasks. To add a reminder to a company and/or contact, go to the Customers section and click the Add Reminder button. Your Customer/Contact reminders will show up along with your ticket reminders in the My Tickets section.